One of the coolest mix of special effects and real images I've ever seen. Simply stunning. This is an archived blog post from 2009, and was possibly my first attempt at astrophotography. 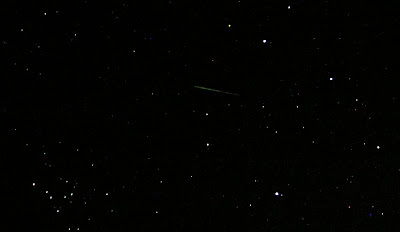 On Nov. 17th there was a really cool meteor shower, so me and a bunch of friends woke up at 3 am to watch them. To get better viewing we drove out of Kingston, hoping to find a place that was dark and comfortable. At our first possible stop, the dark field beside us turned out to be very grassy, and there was even a fallen part of the fence to let us in. As I was the leader, and the field was ideal, It made me look like a pretty good random spot finder, but I confess it was really just some awesome coincidences! I brought my camera and ran it took pictures constantly with a 15s shutter speed, sequence mode, and a bunch of elastics to hold the button down. 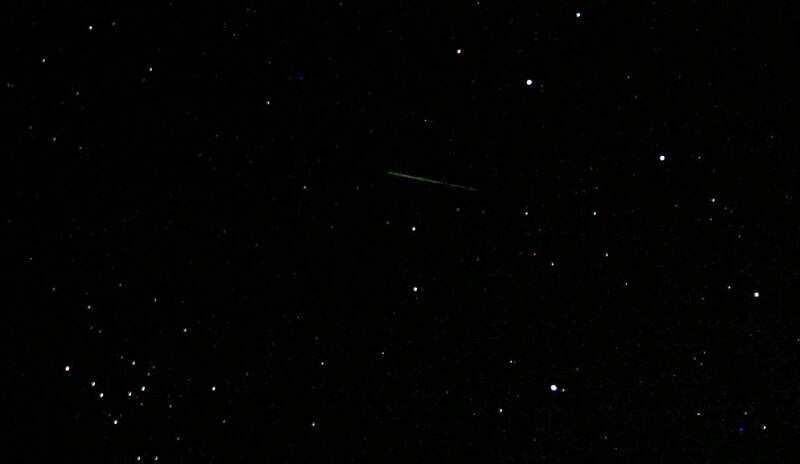 It didn't turn out all that well, but I did catch a picture of a shooting star! It's the faint white streak... Much cooler in RL.